That sharp shooting pain in your lower back from slouching in your office chair shouldn’t be ignored any longer! It’s time you straightened your back, put down that coffee cup, and learn about how you can help yourself and your lower back. Lower back pain can be caused by a number of problems with any parts of the complex and interconnected network of spinal muscles, bones, discs, or tendons in the lumbar system. The lumbar system is a region of the lower back which starts just below the ribcage and ends at the pelvic region. Lower back pain is one of the most common causes for missed work and affects 31 million Americans at any given time. Up to 85% of working individuals can expect to experience this pain during their lifetime. Lower back pain can result from a number of things, including: being overweight or inactive, tasks related to your job (sitting too long, lifting or pulling objects), the use of over-stuffed purses or bags, improper gym workouts, your posture (how many times did your mom tell you to “sit up straight!”? ), injuries (especially in the spinal discs), or chronic conditions like spinal stenosis. Lower back pain, especially in less severe cases, can usually heal on its own, but there are many things you can do to speed up the process. Aside from using heating pads, taking warm baths, massage therapy, medications, injections, or acupuncture, there are many online articles describing exercises you can do to help relieve your lower back pain, but not all are evidence-based and backed by medical studies. The seated chair twist is a great yoga pose to do at work, as it requires a chair. This pose is known to tone, massage and rejuvenate the abdominal organs, as well as ease back tightness. Along with being referenced in Dr. Crow’s and Dr. Saudek’s literature reviews on exercises for back pain, chair twists have also been shown to lower pain in prostate cancer patients who are undergoing radiation therapy (Ben-Joseph et. al., 2015). How to do the pose: Sit sideways on a chair, with the chair back to your left, feet flat on the ground and your heels directly below your knees. As you inhale, turn your torso and shoulders to the left, while keeping your head straight forward. 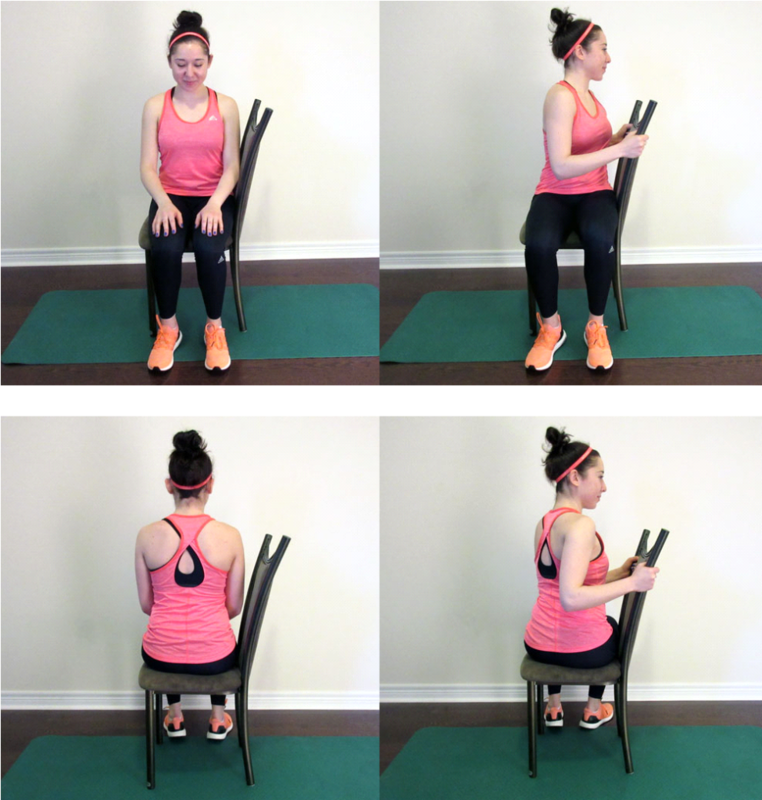 Hold the sides of the chair back with your hands to help turn your body as far to the left as possible. Once you have completed the turn, bring your head in the same direction. Hold the position for 5 seconds. Slowly exhale as you turn to the starting position. Repeat the pose on your right side. The cow pose is a yoga position which focuses solely on the lower back. This pose, backed by the researcher conducted by Dr. Tekur and his team, strengthens the abdomen and improves spinal flexibility. In a study conducted by Dr. Sapna Gupta, spinal extension exercises like the cow pose were able to reduce participants’ pain scores by 65.8%. To do this pose: Start on your hands and knees, aligning your wrists underneath your shoulders and your knees underneath your hips. Keep your head, hips, and back straight and parallel to the floor. As you inhale, simultaneously lift your hip bones upwards while allowing your belly to sink towards the floor. Lift your head and relax your shoulders. Hold this position for 5 seconds then return to the starting position. This stretch (also known as a lumbar extension or a spine extension) is a common yoga stretch but it also comes with supporting research. In the same study conducted on the side-lying double leg lift (#9), researchers also tested the efficacy of this stretch on relieving lower back pain duration and intensity. All groups in the study (which varied on whether participants received additional exercises/relaxation postures or not) reported less back pain after performing this stretch. To do this stretch: Lie on the floor, face down. Put your hands at your sides, at shoulder levels like you are about to do a push up. While keeping your back relaxed and your hips on the floor, push your shoulders up and straighten your arms. Exhale when you reach the top but do not hold the position. Slowly lower yourself to the starting position and repeat the motion 10 times. Also known as the knee extensor stretch, this stretch is known to help lower back pain by stretching the hip flexors (muscles located at the groin), which are attached to the transverse processes of the spine. Normally, hip flexors bring lower back pain when they are tight, and they create a pulling torque on the spine. A study by Dr. Gupta reported that there was a 53.2% improvement in lower back pain scores in participants after completing flexion exercises, including this stretch. To do this stretch: Lie down on your back while holding a strap in both arms. Put the strap around the sole of your right foot and lift your right leg straight into the air (while keeping the other leg flat on the floor). You should feel a stretch in the back of your thigh and calf muscles. Repeat this exercise for the left leg. Another common yoga pose, the two-knee twist encourages movement and mobility in the spine and vertebrae. Along with helping alleviate lower back, spine and hip pain, this pose also improves digestion and stretches the chest, shoulders and upper back. Both a study by Dr. Tekur and another by Dr. Mellin reported that exercises involving lumbar rotation (like the two-knee twist pose) help to alleviate lower back pain. To do this pose: Lie on your back with your knees bent into your chest. Extend your arms to your sides, aligning your hands with your shoulders and palms touching the floor. As you exhale, lower your knees to the ground on your left. Keep both shoulders pressed down firmly. Hold for 30 seconds on this side, and then slowly raise your knees back to your chest. Repeat again for the right side. This stretch, referenced by Dr. Grant Cooper in his book Non-Operative Treatment of the Lumbar Spine, is a popular and easy stretch for many people with lower back pain. This stretch directly combats the lower back and helps alleviate pain. To do this stretch: Lie down on your back with your feet flat on the floor and your knees bent to 45 degrees. Your arms should be placed on your chest and your back should be slightly arched so that your lower back is slightly off the ground. Exhale as you push your belly button towards the ground so that the arch in your back disappears. As the same time, lift your buttocks and press your lower back firmly against the floor. Hold for 3 seconds, and then return to the start position. This yoga pose is a common pose used to work out the core, in order to relieve lower back pain. It is used to train the body to stabilize the lumbar spine during upper and lower extremity movement. In a study by Dr. Tekur and colleagues, it was found that, as part of a compilation of yoga poses, the bird-dog pose was able to successfully lower the intensity of lower back and even improved spinal flexibility only after 1 week of the study. To do this pose: Come to a hands and knees position on a mat; your knees should be underneath your hips and your wrists should be underneath your shoulders. Slowly raise your left arm straight ahead of you while simultaneously raising the right leg straight behind you, both parallel to the floor. Your back should be straight and parallel to the floor while you hold for this position for 5 seconds. Slowly return the arm and leg to their original positions. Do this again with the right arm and left leg. The wind relieving pose is a common yoga pose used to strengthen the back and abdominal muscles, tone the leg and arm muscles, enhance blood circulation, massage the intestines, and help digestion and release of gas. Multiple studies have reported on the lower back pain benefits of performing spinal flexion (forward bending) exercises. A study conducted by Dr. Sapna Gupta reported a 53.2% improvement on pain scores for participants performing spinal flexion exercises like the wind relieving pose. To do this modified pose: Lie flat on your back and relax the whole body. Bend the left leg and bring the thigh and knee as near as possible to the chest, while the other leg remains straight on the ground. Place your hands over the knee and interlock the fingers. Gently pull the knee closer to your chest. Breathe in deeply. Slowly exhale and lower your left leg back to the starting position. Switch legs and repeat the pose. You can also do this pose by lifting both legs at the same time. In a study conducted by Dorothy Curnow and her colleagues at the University of Technology in Sydney, Australia, it was found that this Pilates move (along with the press-up back extension stretch, #3) successfully reduced the duration and intensity of lower back pain in the participants. This move is used to lengthen and strengthen the core and obliques (side muscles) in particular. To do this Pilates move: Lie on your left side on the floor with your legs stacked, one on top of the other. Your legs should be placed slightly in front of your hips, while your head lies in your left hand for support, and your right arm is in front of you to balance you throughout the exercise. Squeeze both legs together and lift both legs off the ground simultaneously. Hold for 5 seconds, and then slowly lower them back to the starting position. Switch to your right side and repeat the move. Planks are commonly recommended for lower back pain because strengthening the core (which comprises of the abdominals and lower back muscles) can greatly reduce lower back pain. When one part of the core is stronger than the other, balance is lost and posture is off, which can result in back pain. Dr. Grant Cooper recommended this exercise in his book Non-Operative Treatment of the Lumbar Spine. This exercise was also shown to be effective for lower back pain treatment in a study by Dr. Kong and his colleagues; planks were shown to successfully stabilize the body trunk and decrease lower back pain. To do this exercise: Lie down on your stomach and then prop yourself up by your elbows and knees. Your head, upper back, lower back, and buttocks should be in the air and also line up straight. Your legs (from the knee to the toe) should lie flat on the ground while you use your core to keep the rest of your body in the air. When completing back pain exercises, it is recommended that you finish with a relaxation pose. A very popular pose is the Shavasana (corpse) yoga pose. Many people consider the Shavasana pose to be one of the most important parts of yoga practise. In a study published in the Journal of Exercise Science and Physiotherapy, the Shavasana pose proved to lower both stress and blood rate levels in participants. The Shavasana pose has been suggested to prevent and lower the intensity of migraines in a study conducted by Dr. Agarwal and Dr. Pandey. The Shavasana pose has also been linked to a decrease in anxiety and muscle tension, a decrease in the consumption of oxygen, an increase in general productivity, an increase in energy levels, and an increase in concentration and memory. To do this pose: Lie down on your back, with your feet spread at a 45 degree angle. Put your arms at your sides, also at a 45 degree angle. Your fingers should be curled naturally and your eyes closed. Now comes the reason why this pose is so beneficial: focus on your breathing. Breathe in and out slowly, focusing on either your breath as it leaves your nose or on your chest as it moves up and down. Inhale for five counts, pause, then exhale for another five counts. This pose is normally kept for 20-30 minutes. To exit the pose, begin by deepening your breath. Gently move your fingers and toes and slowly gain back awareness of your body. Roll to your right side and rest there for a moment. While exhaling, bring yourself into a comfortable seated position. Move through the exercises at a slow pace and always stop if you feel discomfort during any of the exercises. As always, consult your doctor before performing any of these exercises to ensure they are recommended for your specific lower back pain.